I’m not called the queen of the leftovers for nothing. After I simmered a giant fish carcass to make stock, I was able to salvage a couple of cups of fish meat, some in chunks, some flaky. My method of cooking the stock is very gentle so the leftover fish had decent texture, though not tremendous flavor. It was codfish so didn’t have a strong flavor to start with. 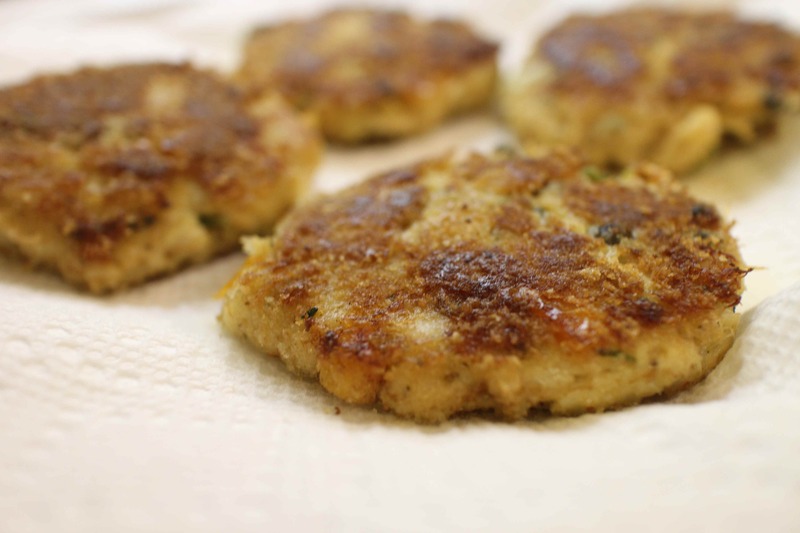 I decided to make fish cakes using Ina Garten’s approach to crab cakes from her first cookbook, The Barefoot Contessa. The base for the cakes includes plenty of vegetables that are stewed with capers, parsley, Old Bay seasoning, Worcestershire sauce and hot pepper sauce. No problem with flavor. Held together with mayonnaise, mustard and a beaten egg, these whipped up into moist and flavorful patties. Even though this was completely improvised, I’d make this again with either leftover fish or raw fish. And of course crab during the summer. Flake the cooked fish or mince the raw fish. In a large sauté pan over medium heat, melt the butter in the olive oil and add the onions, celery, pepper, parsley, capers, Old Bay seasoning, Worcestershire sauce, and red pepper sauce and cook slowly until the vegetables are well cooked, about 15 minutes. Remove from the heat and cool. Combine the vegetables and fish flakes. With a fork, combine mayonnaise, mustard and egg and fold the mixture into the fish and vegetables. Add more mayonnaise and/or bread crumbs so that the mixture is not watery. (More will seem necessary for uncooked fish.) Refrigerate the mixture for 20-30 minutes and form into patties. If you want a crust, coat the patties with bread crumbs. Warm a large flat pan over medium high heat and add a little butter and vegetable oil. Cook the fish patties in a single layer with space between them over medium heat, flipping them once. You may have to cook them in batches. Raw fish will take only a little more than the pre-cooked fish since the egg is the governing ingredient. Makes about 6 three-inch patties.